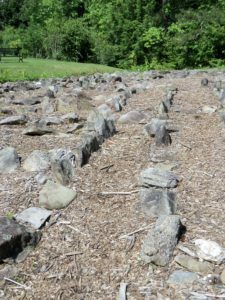 Whether you are seeking inner meditative peace, or just a nice walk, following the path of a meditation labyrinth may be for you. The Buckhorn Inn “Rachael’s Labyrinth” is named for Innkeeper Rachael Young. The path is constructed of local fieldstone and is encircled with native wildflowers and plants. Our labyrinth is of the medieval style. 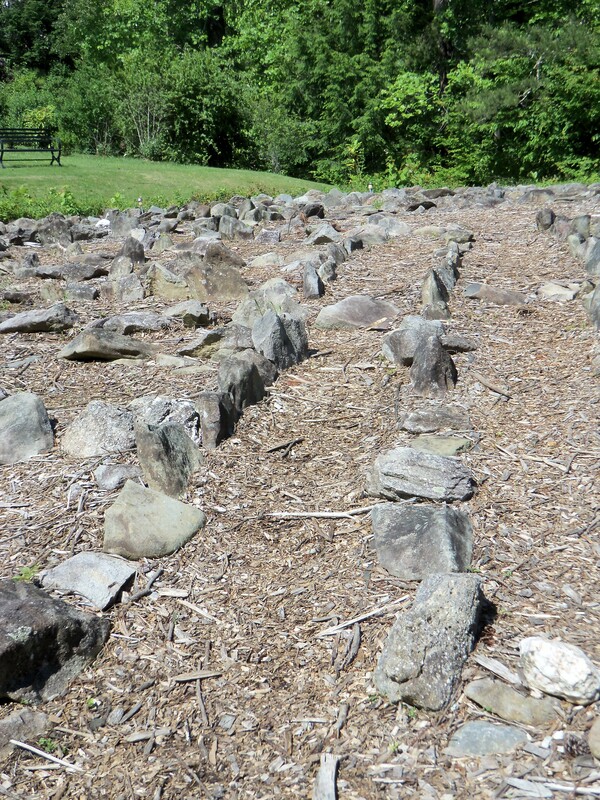 Guest Amanda Writesman took this beautiful photo of the Buckhorn Inn labyrinth. 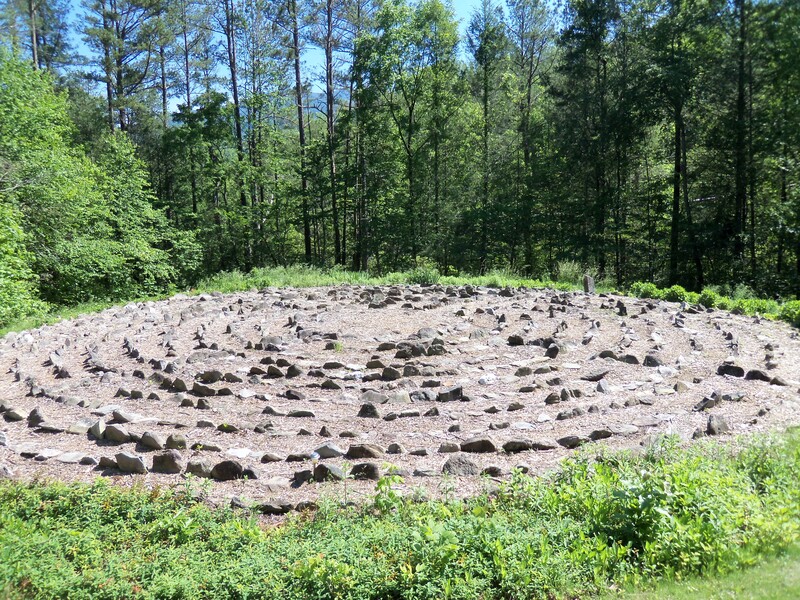 Labyrinths were in use long before recorded history. They all feature a single path that leads into the center of a space and then back out. Most cultures have a type of labyrinth. They have been associated with mini-pilgrimages and walked to reinforce protection, to bring good fortune, or to overcome difficulty. Today’s labyrinths offer the opportunity for meditation and slight concentration. Every journey is a personal one–everyone gets something different from the walk. The world-wide labyrinth locator http://www.labyrinthlocator.com lists 4,977 labyrinths in 80 countries, including the one at Buckhorn Inn in Gatlinburg, Tennessee! The Smithsonian Magazine highlights six labyrinths which have been heralded for their beauty and history. The Chartres Cathedral in Chartres, France dates back to the year 1205. According to the magazine, scholars believe that the path symbolizes “the human journey from sin to redemption”. When you walk through the Old Summer Palace in Beijing, China, you are walking through a structure built in 1709. The path is housed in a garden called the Garden of Perfection and Light. The 864-acre property was intended to be a private garden for Chinese emperors, but was destroyed by the British and French forces in the 1860s. The remaining ancient landscaping is like nothing anywhere else. Dunure Castle in Scotland was a 13th century stronghold. The stone labyrinth is on the beach near a park and offers walkers a wonderful view of both the sea and the castle’s remains. Lands End, San Francisco was built by artist Eduardo Aguilera in 2004. The labyrinth is located on a rocky outcropping overlooking the Golden Gate Bridge. The path is tucked away from view. Do you enjoy walking labyrinths? Please share your pictures and stories. We would like to feature them in a future blog post. Honeybees pollinate numerous crops. In Tennessee the value of crops benefiting from their pollination exceeds $119 million annually. Unfortunately, diseases and pests have caused annual losses of bees, in some years as many as 50%. 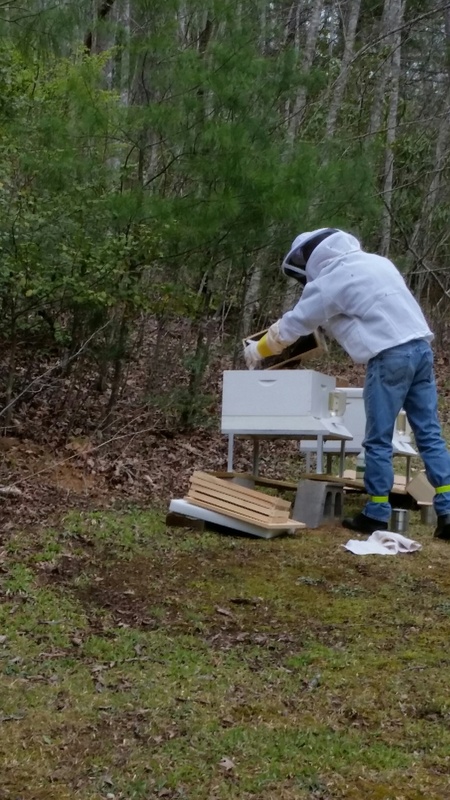 Two honeybee hives have been added to the Buckhorn Inn grounds. We are pleased to be telling you that Buckhorn Inn is doing its part to protect and support these important pollinators. Thanks to our son Jack, two new hives have been put up and two colonies of bees installed. Queen Bee Elizabeth and her minions are on the left, while Queen Bee Victoria has her kingdom in the hive on the right. Our immediate goal is to increase the population of honeybees. But ultimately we hope to produce enough delicious honey to supply the Buckhorn Inn kitchen and to offer some to guests. 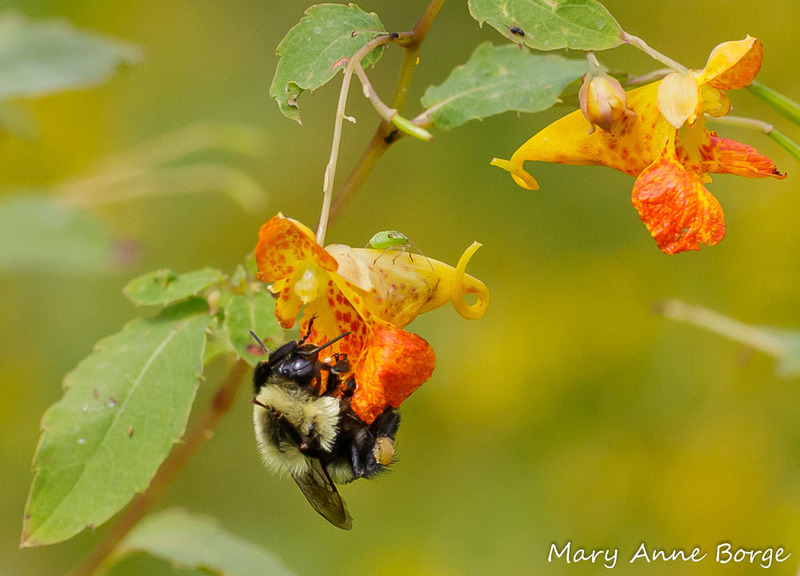 We thought you might want to learn about honey bees along with us! 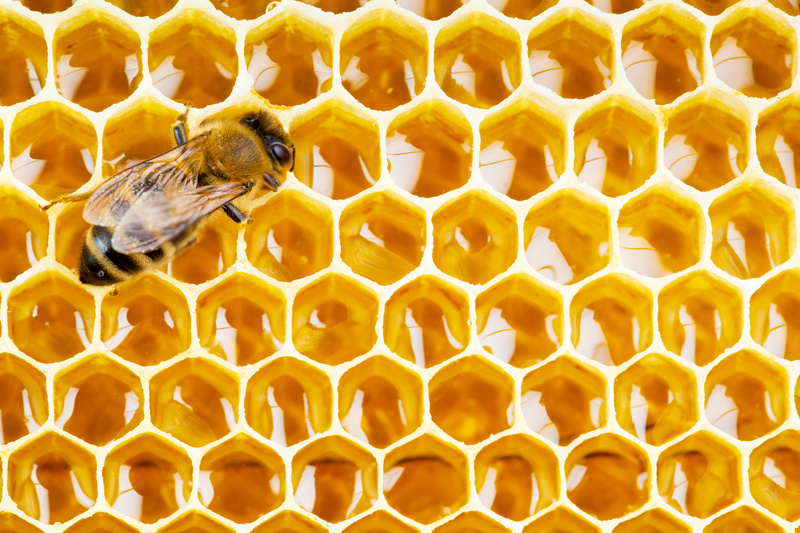 Honeybees produce honeycomb made up of hexagonal cells. 2. Honeybees can fly as fast as 15 miles per hour and can travel as far as six miles. Their wings beat about 200 strokes per second. 3. In order to collect one kilogram of honey, a hive of bees will fly the equivalent of three orbits around the earth. 4. The queen bee can live up to five years. Her colony consists of 20,000 to 60,000 bees. A forager bee visits 50 to 100 flowers on each flight from the hive. She repeats these trips all day, averaging as many as 2,000 flowers per day. 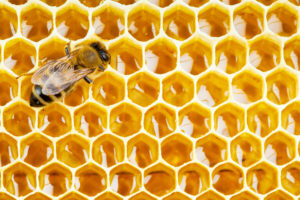 It takes six to eight pounds of honey ingested for bees to produce one pound of beeswax. The only bees that sting are the worker bees. They will only sting if they feel threatened, and will die once they sting. In the lifetime of a worker bee, she produces about 1/12th teaspoon of honey. Bees overwinter by clustering in their hives to keep the queen and themselves warm. They feed on the honey collected during warmer months and on syrup provided by the beekeeper. Forager bees find flowers then return to the hive and share detailed directions. In 1973 Karl von Frisch received the Nobel Prize in Medicine for cracking the code of the bees–the waggle dance. Watch our blog and Facebook and Instagram posts for more information about our bees. We are proud members of the beekeeping associations of Sevier County and Tennessee. You may visit http://www.tnbeekeepers.org for information on the resources they offer. 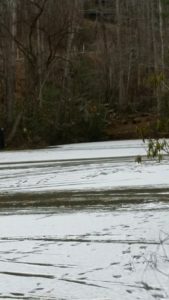 If you have been following the Buckhorn Inn on social media, you know we have been devoting much time and energy to being good caretakers of the pond on our nature trail. This past summer we released grass carp into the pond to help us optimize the plant growth. We also added a foundation. The fountain not only is beautiful and provides soothing noise for visitors, but it also helps us maintain the good health of the water. A more recent project has been the removal of fallen trees around the pond. Kevin Howard with Rex Howard’s Landscaping came up with a clever way to manage this work. In Buckhorn Inn’s 80 years there have been few days when it was cold enough to freeze Buckhorn Pond enough to support about a dozen large men, but this winter was one for the records. We had contracted with the firm to clear dead trees and debris on the side of the pond next to busy Buckhorn Road. Rather than trying to clear this area from the roadside, Kevin had his men pile logs and debris on a heavy tarp and pull it across the frozen ice to the other side where it could be more easily loaded on trucks. One of the fellows was assigned to sweep up all the debris from the ice–we expect him to go out for the U.S. curling team for the next Winter Olympics after all that practice! 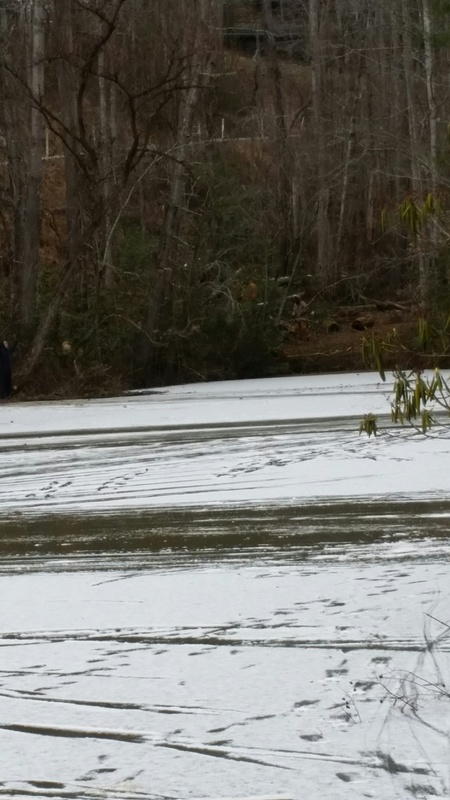 Our pond rarely freezes solid, but Mother Nature picked a perfect time for this cold snap! We are so pleased with the work thus far. 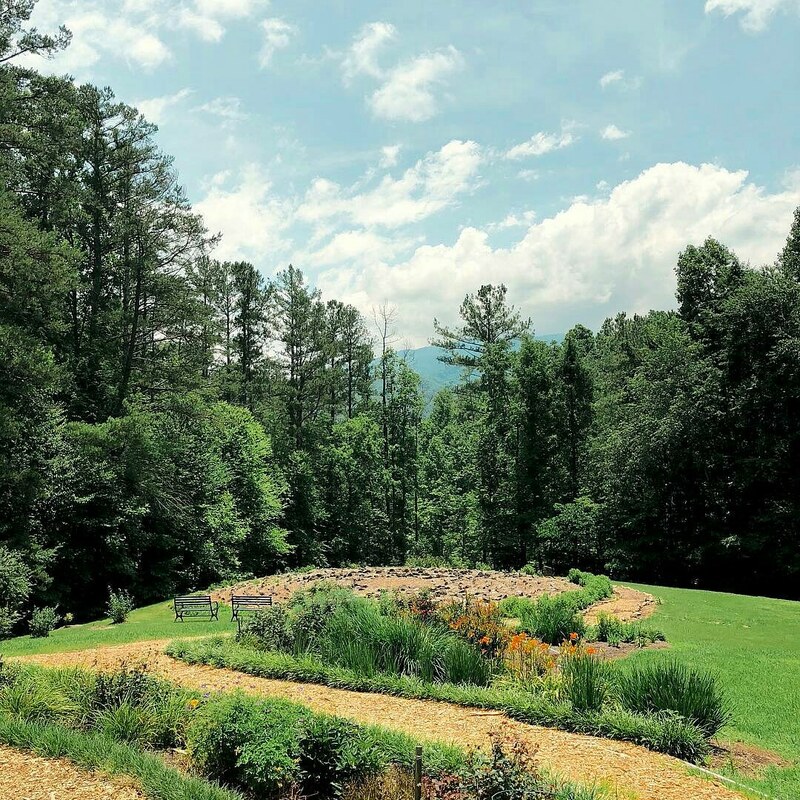 The next step will be installing some beautiful plantings that will provide screening from busy Buckhorn Road and add to the natural beauty of this space. We will be adding native trees, bushes, and plants that will be at home in this environment. Our spring-fed pond will become an even more special place to enjoy your sack lunch, read a book, and enjoy the quiet beauty of nature. We know that many of you have expressed how much you miss the swans that used to grace Buckhorn Pond. We have good news! Innkeeper Lee presented John with two swans for Christmas! The swans are coming from North Barrington, Illinois. They cannot safely be shipped by plane until the weather warms up, so we look forward to their arrival this spring. We are working on setting up our “swan cam” so that you can monitor the activities of this pair from anywhere! In our January newsletter we will provide additional information on this pair and how we are preparing for them. Be sure to read the article for additional information! Have you visited Buckhorn Pond? The spring-fed pond was created after Douglas Bebb built a dam there in the early 1950’s. The pond was designed with an ingenious overflow to protect the dam during heavy rains. Bass, carp and perch make their home here, as well as frogs, turtles and a few snakes. The brilliantly-colored wood duck, spotted sandpiper, heron, and other water fowl are attracted here. Buckhorn Pond is home to fish, amphibians, and water fowl. 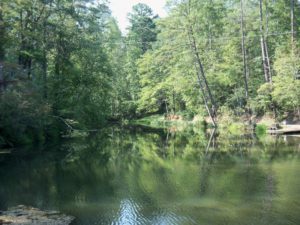 We are responsible caretakers of our property, and invited a representative from the Tennessee Department of Natural Resources to review Buckhorn Pond and provide advice. He told us that our water and surrounding area is in excellent shape! His only recommendation was that a species of carp, the grass carp, could help us more easily maintain optimum levels of water plants. Our research revealed that the local farmers’ co-op is visited about once a month by a truck selling live fish. 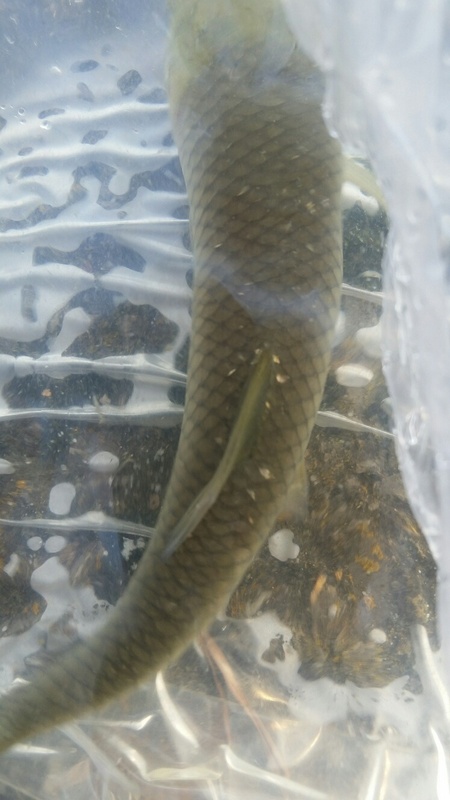 We went there on “fish truck day” and purchased six 12″-long triploid grass carp. The size was important as the naturalist told us if they were too small they could be eaten by the bass, and if they were done growing, they would not eat many water plants. Six grass carp were released into Buckhorn Pond. Innkeeper John and daughter-in-law Sharon took the large plastic bags filled with water and carp down to the pier. They “tempered” the fish by adding water from the pond to the bags until the temperatures equaled. Then they lowered the bags into the water and let the fish swim out. They report the fish looked happy in their new home! The grass carp is a large, herbivorous, fresh-water fish. It is used as a food fish in China, but in the United States and Europe used mainly for controlling aquatic weeds. The use of these fishy friends lessens use of herbicides. The fish live up to 11 years and eat three times their weight in vegetation daily. They grow rapidly, as much as 10 inches in a summer. The average length of a fully-grown grass carp is around 30″. The grass carp are sterile and will not produce young in our pond. 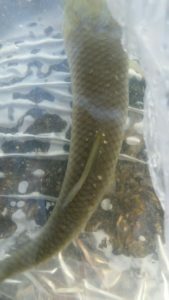 For more information on stocking ponds, visit http://tn.gov/twra/article/fish-for-stocking. 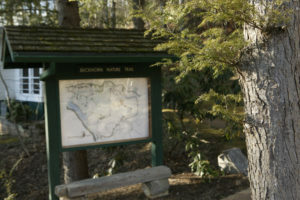 The Buckhorn Inn’s pits for pitching horseshoes are located near stop 18 on our Nature Trail. This is the stop near the glider and St. Cordelia’s Garden. What a great way to while away an afternoon! 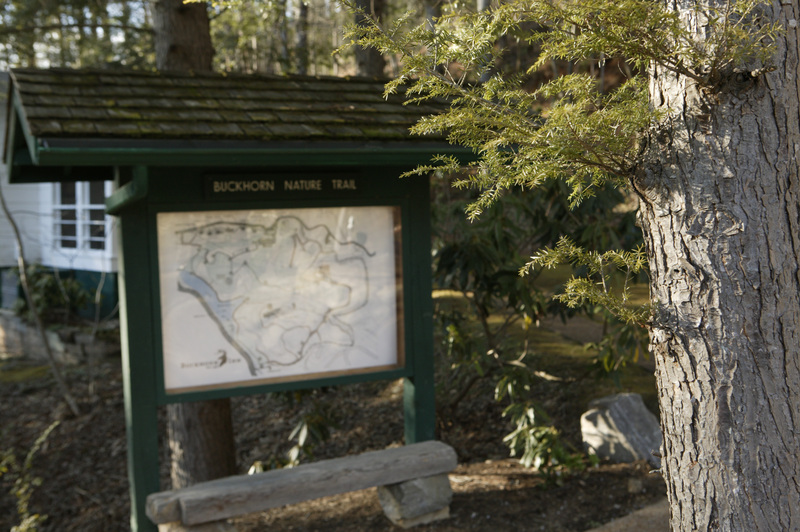 The Nature Trail begins at the Buckhorn Inn. Horseshoes are a game of accuracy. became popular and the game spread around the world. Pitching shoes was a favorite pastime of soldiers and when they returned home they introduced the activity to their communities. Following the Revolutionary War, England’s Duke of Wellington said “The War was won by pitchers of horse hardware.” In 1869 England created very exacting rules for the game. The first worldwide horseshoe tournament was held in 1910 in Kansas. The winner received a belt with horseshoes affixed to it. Let’s hope he didn’t tumble into a large body of water wearing such a heavy trophy! In 1914, the game became more formalized. 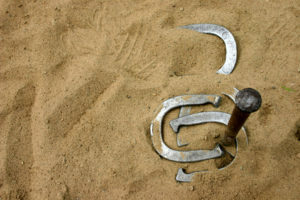 The “Horseshoe Guide” provided rules on scoring, stake height, shoe weight, size of pitchers’ box, and the distance between stakes. Since 1926 the governing body of the sport has been the National Horseshoe Pitchers Association of America http://www.horseshoepitching.com. It is estimated that there are more than 15 million horseshoe enthusiasts in the United States and Canada. To score in this game, you either must throw the shoe around the stake, or throw the shoe closer to the stake than does your opponent. This scoring system led to the saying “close only counts in horseshoes and hand grenades”! We hope to see you trying your pitching the next time you visit us at the Buckhorn Inn! Many guests ask us when is the best time to see rhododdendron and mountain laurel in bloom. Well, it depends–mostly on the elevation. Here at Buckhorn where our elevation is about 1600 feet, May is a great viewing time. But up in the mountains, July is the best time. There are many other summer wildflower wers besides these two perennial favorites in bloom right now, including the beautiful jewelweed shown left. The Great Smoky Mountains Association recommends several good viewing spots. Low Gap (from Cosby to Low Gap) – Crimson Bee Balm, Rosebay Rhododendron, Wood Nettle, Pale Jewelweed, Canadian Violet, Pipsissewa, Common Elderberry, Loosestrife, Galax, Basil Bee Balm, White Clover, Wild Hydrangea and Blackberry. Appalachian Trail (From Low Gap to Mt. Cammerer Trail) – Blackberry, White Clover, Mountain St. John’s Wort, Loosestrife, Galax, Wood Nettle, Wild Hydrangea, Flame Azalea, and Partridge Berry. Mount Cammerer – Galax, Rosebay Rhododendron , Wild Hydrangea and Blackberry. 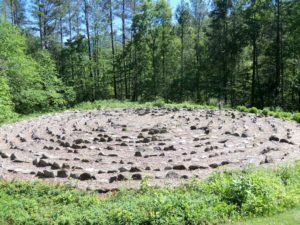 Labyrinth at Buckhorn Inn One of Largest in U.S.
1. Stand at the entrance. Center yourself with a few deep breaths. 2. Begin to walk, concentrating on the sensations of the placement of your feet and the rhythm of your breath. If you are stressed, you may find that walking at a slow pace will help to quiet your mind. As outside thoughts enter your mind, acknowledge them, then bring your mind back to the present sensations of walking. 3.Upon reaching the center, pause for a moment of quiet reflection. 4. Walk out, appreciating the sense of calm. Your journey through the labyrinth begins with your first step. Why Stay at a Bed and Breakfast Rather than a Hotel?